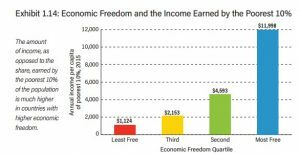 Zehut advocates a free economy. It is enough to look at the state of the economies of the world to see clearly that the adoption of a liberal economic policy that encourages free enterprise brings growth and prosperity to all sectors of the population, while centralized economic policy and government intervention hinder growth and harm all strata. The State of Israel is indeed a rich country, but the indices of its economic freedom lag behind many countries. This situation means that the wealth does not reach the citizen’s pocket, but is swallowed up by government mechanisms or remains in the hands of the “cronies». Only in areas where the state is not involved, such as high-tech, is there growth. In order for the money to reach the average citizen, the State of Israel must increase economic freedom in all areas. Beyond the efficiency of the liberal economic model, Zehut believes that this is the most moral economic method. It guarantees maximum freedom for the citizen to carry out transactions of his own free will and to work to improve his economic situation. The economic plan that Zehut advocates will put an end to the high cost of living, a situation in which Israeli citizens are forced to work more than the citizens of most countries in the West, earn the least and pay the most. 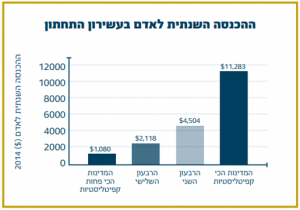 The current taxation system has a complex and cumbersome structure that harms Israel’s economy. The first casualty is the entrepreneur, who has difficulty understanding the way the system works and wonders how his tax payments rise sharply when he starts to succeed. On the other hand, large and capitalized companies can afford to employ top notch accountants who manage to plan their tax payments to make them as low as possible. Therefore, Zehut proposes the flat tax system: a uniform rate tax that applies to all types of income — without tax brackets, without credit points and without leniency for those close to the system This method should encourage all Israeli citizens to initiate, move forward and succeed as much as they can. It will also cancel one of the main tools of the government for planning the economy from above. In addition, Zehut is committed to lowering the tax rate as much as possible for the average citizen. Corporate tax is one of the main obstacles to economic growth. This tax affects thousands of businesses and constitutes a negative incentive for foreign companies considering investing in Israel. Therefore, Zehut will reduce corporate tax in a horizontal, equal and transparent manner for all types of companies in Israel. In addition, Zehut believes that it is not the role of the state to steer the market. Any attempt to artificially influence industry from the top is at best destined for failure and at worst, invites corruption. Therefore, according to its economic model, Zehut will prohibit the granting of benefits, concessions and grants by the state to certain companies, will close the governmental bodies whose role is to assist entrepreneurship or encourage the industry, and allow the private market to do its part. In the field of regulation and bureaucratic barriers, Zehut’s goal is to significantly facilitate the opening of businesses and doing business in Israel. 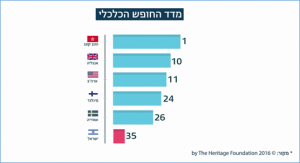 Its stated ambition is to bring Israel from its unflattering place in the world index of ease of opening business (54th place) to the first ten. In this framework, the necessity of any regulatory requirement will be carefully examined and will be canceled or mitigated accordingly. Government intervention in order to make it difficult to import products for the benefit of local industry is a severe blow to the Israeli public, which could benefit from cheaper products. This intervention is actually the subsidization of inefficient industries by the general public. Zehut will work to gradually eliminate the customs and import quotas. In addition, all restrictions on imports for non-economic reasons will be reviewed and unreasonable restrictions will be removed. In the same spirit, Zehut will limit the power of the Standards Institute, which it believes constitutes an obstacle to the import of products, even if they meet the strict standards accepted worldwide. Zehut sees the reduction of the national debt as a primary economic task. The government must take responsibility for its citizens and reduce the national debt that slows the Israeli economy and is a burden on future generations. Zehut will require measures that reduce the national debt, such as the use of surplus collection. Zehut sees the policy of the Ministry of Transport in Israel as wrong. First, income from taxation on vehicles (NIS 40 billion in 2016) is much larger than the expenditure on road construction (NIS 6.1 billion in 2016). In other words, the public does not see its money translated into infrastructure. Second, many funds are invested in public transportation in order to «educate» the public to switch from private cars to public transportation to reduce air pollution. Beyond the moral aspect of the principle that it is not the role of the state to influence the way of life of citizens and their choices, this policy achieves the opposite of its intention. The inefficiency of the central planning of public transport that causes semi-empty buses to travel on the roads, the high tax on vehicles that raises the price and leaves old cars on the road and the government’s opposition to private cars (such as Uber) – all cause more private vehicles to stay on the roads, increasing air pollution, as well. Therefore, with regard to transportation, Zehut proposes the decentralization of powers. Regarding the infrastructures of the local authority, the authority will be transferred to «metropolitan transportation authorities» that will be in each regional council. With regard to transportation itself, the Ministry of Transportation will cease to be the financier and superintendent of the companies. The considerations for operating lines and purchasing vehicles will be in the hands of the companies only. In addition, Zehut believes that it is possible to learn from what is happening in the world in different places and to significantly upgrade the infrastructures, thereby ending the traffic jam problem. Zehut will reduce tax and bureaucracy on private car owners, enable car-sharing companies to operate in Israel, and at the same time reduce the tax on taxis to allow for fair competition. Zehut’s vision is a reality in which the purchase of an apartment in Israel will be within the reach of every adult Israeli with an average salary without being enslaved to a mortgage for most of his life. In order for this reality to materialize, one must first recognize that the main cause of the housing crisis is the low supply of residential land, which is fueling housing prices. This reality is the result of the state’s monopoly over the land (93% of the state’s land is registered in the name of the Israel Land Authority). The ILA releases land with high taxes and draconian bureaucracy, and the construction process takes years (much more than is customary in other countries) and is subject to many restrictions that interfere with market dynamics. In addition, the building freeze in Judea and Samaria, and even Jerusalem, prevents new construction and exacerbates the housing crisis. The land belongs to the citizens, not to the state. Zehut will dismantle the ILA and transfer the vacant lands it holds to the control of the citizens. Beyond the economic and moral significance of returning the land to the citizens of Israel, this step will enable the land to be traded on the open market and significantly increase the supply of land for construction, thereby lowering the price of land in Israel. The designation of land and restrictions on construction will be determined by the local community. The state and local authorities will not be able to determine the use of private land and the restrictions on construction. The landowners’ community in a particular area will determine whether to restrict the designation of the land to industry, commerce, housing, agriculture, etc. The community will decide on imposing restrictions on construction, such as limiting the maximum building height. This will enable the flexibility required to develop construction in communities in accordance with the needs of the community. The phenomenon of land being exploited badly or even left empty in anticipation of rezoning will cease. Many of the communities are expected to respond to market demands and to increase the number of residential areas, thereby lowering land prices. Reduction of bureaucratic barriers. Approval processes for construction will be significantly reduced and simplified and many regulatory restrictions will be canceled or moved to a more local level (local authority level or community level). Regulatory bodies will be eliminated or reduced accordingly. This will make the construction process easier, faster and more profitable, for construction developers and for the benefit of the public. The application of full sovereignty in Judea and Samaria. With the application of sovereignty (see below, «The Diplomatic Plan»), the construction freeze will be canceled and all the restrictions and special authorities for Judea and Samaria will be canceled. This will enable free construction in the heart of the country.